On 4 January, 2010, a gigantic mass of rock came down the steep slopes above Attabad village in the Hunza Valley of Gilgit-Baltistan (Northern Pakistan). The landslide buried the Karakorum Highway over a stretch of more than one kilometer and formed a barrier which completely blocked the flow of the Hunza River. Behind this barrier a lake developed which inundated one village completely and three others partly. 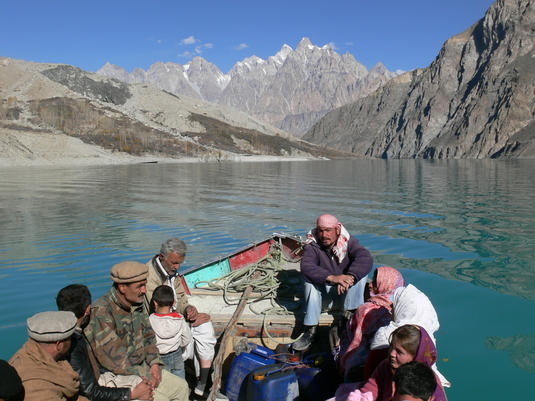 Since then, the upstream area, Gojal, is accessible only via a not very reliable boat service. According to local perspective, there has been a massive mismanagement of this disaster by the regional and federal governments. The research project is interested in the political aspects of this disaster and asks the question, how the experience of the landslide and its consequences is transformed into political action in local, regional, and national context. The research starts from the assumption that "natural" disasters are essentially social events which may have decisive social and political consequences. The project aims at a political ethnography of Gojal in the regional context of Gilgit-Baltistan, on the basis of the political dynamics that unfolded in consequence of the landslide. Team: Prof. Dr. Martin Sökefeld, Annette Töpfer, MA. Sökefeld, Martin (2012). Visualising Disaster: Gojal after the Attabad landslide in Northern Pakistan. Tsantsa – Revue de la Société Suisse d’Ethnologie 17: 212-224. Sökefeld, Martin (2012). The Attabad-Landslide and the Politics of Disaster in Gojal, Gilgit-Baltistan. In: Luig, Ute (Ed. ): Negotiating Disasters: Politics, Representation, Meanings. Frankfurt, Peter Lang: 175-204. Sökefeld, Martin (2011-12). Exploring the Link between Natural Disasters and Politics: Case Studies of Pakistan and Peru. Scrutiny 5 & 6: 10-41.